T-Mobile announced on Thursday that it will soon offer the BlackBerry Curve 9315. Make no mistake — this isn't one of RIM's latest BlackBerry 10 smartphones. Instead, it's an entry-level and affordable device that rings in at $49.99 with a new two-year contract and after a $50 mail-in rebate. 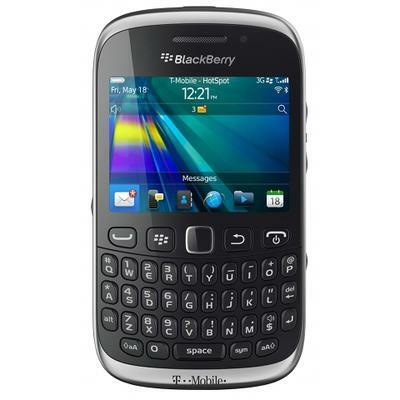 It offers the very basics, including 3G connectivity, BlackBerry 7.1, GPS, expandable microSD storage up to 32GB and a 3.2-megapixel camera. It also comes equipped with support for Wi-Fi calling and a dedicated BBM button. The Curve 9315 will be available for pre-sale to T-Mobile's enterprise customers beginning on Jan. 16 and will be in stores on Jan 23. We think most consumers will be better suited by sub-$100 Android smartphones, or a Windows Phone 8 device. If you really want to hang around for a new BlackBerry, then wait until Jan. 30 when RIM reveals its new BlackBerry 10 smartphones to the world. BELLEVUE, Wash. and WATERLOO, ON – Jan. 3, 2013 – T-Mobile USA, Inc. and Research In Motion (RIM) (NASDAQ: RIMM; TSX: RIM) today announced the most affordable BlackBerry® smartphone on T-Mobile's nationwide network – the BlackBerry® Curve™ 9315. Powered by the BlackBerry® 7.1 operating system with 3G connectivity, the sleek new smartphone is easy-to-use and provides tools that enable customers to stay connected to the people and information that matter most. "At T-Mobile, our goal is to delight customers. The new BlackBerry Curve 9315 will delight customers with unprecedented value while also allowing them to combine their mobile business and personal use in one great device," said Brad Duea, senior vice president of product management at T-Mobile. "The Curve 9315 is the most affordable BlackBerry smartphone on our nationwide network and provides our customers with a wide variety of productivity and social features to keep them connected and make their mobile lives easier." "We're pleased to work with T-Mobile to bring the BlackBerry Curve 9315 to customers," said Richard Piasentin, managing director for the U.S. at Research In Motion. "The Curve 9315 is designed to make it incredibly easy to stay connected with friends, family and coworkers and will be popular with customers upgrading to a smartphone for the first time, as well as existing Curve customers looking for a step up in speed and functionality." The new BlackBerry Curve 9315 offers a 3.2-megapixel camera with LED flash and digital zoom as well as video recording capabilities. Customers also have the ability to geo-tag the location of their pictures by utilizing the smartphone's built-in GPS. In addition, the smartphone features a microSD card slot for up to 32GB of additional media storage and a built-in FM radio letting customers tune in to local FM stations. With the BlackBerry App World™ storefront, customers have exclusive access to a wide range of apps, allowing them to enhance their smartphone experience with entertainment, personalization and productivity apps of their choosing. Combining an intuitive interface with a QWERTY keyboard, the BlackBerry Curve 9315 features built-in Wi-Fi® connectivity for voice and data, enabling customers to access the information they need when and where they need it, and Wi-Fi calling, allowing calls and messages over an available Wi-Fi network. With a dedicated BlackBerry® Messenger (BBM™) key, preloaded apps for Facebook® and Twitter® and the Social Feeds 2.0 app, customers can easily interact with their friends, coworkers and social networks whether it's instant messaging, posting or tweeting. 2All prices, taxes and fees additional.1EIP: On approved credit and 0% APR. Qualifying plan required for duration of EIP agreement; account must be in good standing. Available only in participating locations; not available in Wash., D.C.
For more information about the BlackBerry Curve 9315 smartphone, please visit http://us.blackberry.com/smartphones/blackberry-curve-9310-9315.html.For more information on T-Mobile products and services, visit http://www.T-Mobile.com.